This is a time for reflection and gratitude for the opportunities that presented themselves during this year. I decided to select favorites (one) of the things I love (excluding family members!) for 2014. This book was an amazing book, unforgettable. The book covers the personal stories of six Koreans who ultimately defect to South Korea in the 1990s. The book tells their stories without blame but with plenty of guilt as some of the North Koreans leave behind families. There are many moments, one especially painful, when one sees a dish of rice and meat in the backyard of a Chinese home, and has the sudden, awful realization that the food was meant for the dog. She hadn't seen that quanity of rice and meat in years and realizes at that moment that Chinese dogs eat better than North Koreans. The book was filled with moments where you realize the moms are having to make decisions of which child eats and which doesn't... times when I had to put the book down, gather myself, and begin to reread again after a moment. Many discussion topics, relevant world issues. Lacy Eggs. See the post here. This post had a lot of family discussion tied around it and the eggs quickly became my personal favorite and a favorite of Ashley's over the holidays. I found out through discussions with friends that many of them love the browned, crisped edges but felt it wasn't gourmet enough... lesson learned. If you like it that way, it is gourmet! 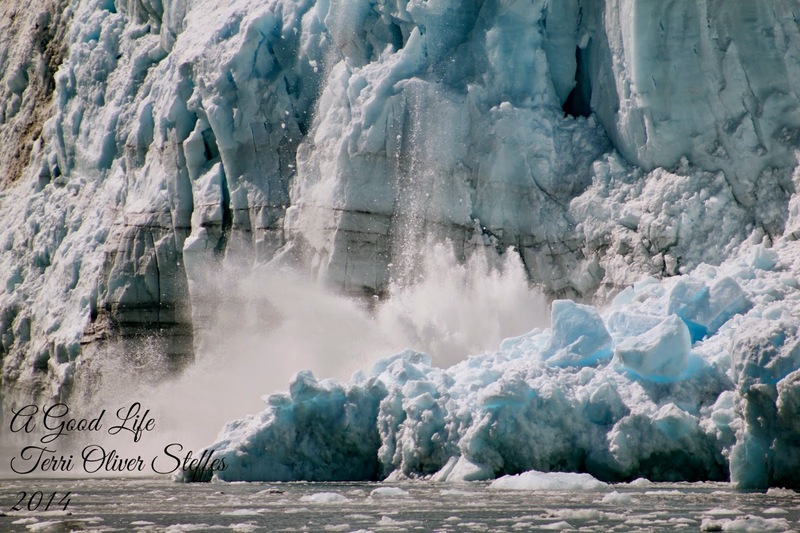 Taken in Alaska during my retirement celebration trip, I love this photo for so many reasons: I caught the calving action of the glacier, the glowing blue in the chunks of ice and the black lines of the glacier, showing the pressure on the ice and the amount of earth caught up in the ice. The hardest of the categories to choose...especially as I think of my favorites throughout the year. Chef, Imitation Game, One Hundred Foot Journey, Divergent, Grand Budapest Hotel, Unbroken, Gone Girl and Theory of Everything. All such amazing movies of the ones I DID see! Of these, the winner (for me) is Unbroken. I am not particularly an Angelina Jolie fan, however, her directorial debut in this film shows her to be a keen eye for detail, for going far enough and then just a bit further, and a stickler for accuracy. She recognized that the story needed to be told, but didn't have to embellish it for Hollywood. Then the story itself, unbelievable stamina during such a horrible time. If you haven't seen it, it is worth your time and money. It makes you understand what what given up for us to have our American freedoms in a sit-up-and-take-notice way. Well done, Angelina. Our family loves our eating out escapades and truly, we have been blessed with some wonderful opportunities. This year, I give Tony's the nod for having the best food experience for 2014. I have posted on Tony's before, here, so I won't go into great detail but if you want to know more, click on the link. What made Tony's stand out from Stone Soup Cottage, another one of my top experiences ever, was the service. The ultimate attention from all the different servers, the owners, managers, etc., was so decadent that I am still talking about it seven months later! This wraps up my favorites for 2014. I'd love to know your favorites as well, getting to know new experiences, movies, books, etc., is the best part of blogging! Love your list! I also loved Nothing to Envy and the only movie on your list I've seen is the Budapest Hotel one, but I loved it! Fun list! Love the photo! The book sounds very enlightening...seems as if it would put our own blessings in perspective. I'll have to look for it. I don't think we went to one movie last year...no reason just nothing caught my eye. However, I may watch Unbroken thanks to your review!